A Bury St Edmunds home and gift shop which formally re-opened last month after a devastating flood is celebrating today having been judged to have the best Christmas window in town. LOFT & SPIRES, at 61 Cornhill, was announced as the winner this morning (December 19) in the annual competition organised by Our Bury St Edmunds, which runs the Business Improvement District (BID). 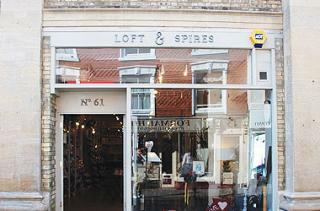 Romy Abraham who owns LOFT & SPIRES said: “This hasn’t been the easiest year for us with the flooding, so to have some good news just before Christmas is wonderful. The shop staff have been amazing in helping to create this Christmas display, by making all the elements for it in their own time. It was a difficult and time consuming job and when eventually finished I was told, in no uncertain terms, by the team that it would be the last window I would be allowed to design – hence, I am feeling particularly smug! LOFT & SPIRES will now hold the prestigious Our Bury St Edmunds shield for a year. It was presented this morning (11am) by the organisation’s Chief Executive Mark Cordell and Sue Warren. Mark commented: “Sue was extremely diligent as a judge and I thank her for the time that she put into this. The businesses in Bury St Edmunds make a real effort with their windows and the job of judging them is not one to be undertaken lightly. Traditional specialist tobacconist and confectioner, with very interesting games shop upstairs.